This very simple statement was the first indication to me that Agent 1.22 was going to be more than a straight forward sci fi action story. This was reinforced through the use of occasional flashback panels throughout the issue. At first, there isn’t much context to these glimpses, and the way they’re presented it’s not initially easy to see what’s going on. The flashbacks continue throughout the book, easily identified as being separate from the action at hand through use of color… in the flashbacks, the palette is all shades of red. Agent 1.22, a cybernetic operative deployed for special missions, is on assignment: Her task is to enter the Fortress DX-B-Biotech Facility, located on the third moon of Pandora-5 in the Epimetheus System. The facility’s contingent of scientists had been working to develop a vaccine for a deadly virus, when all communications with the facility were cut off and the outpost went into lockdown mode. Agent 1.22’s first objective is to find out why the station’s computers are not responding to hails. Secondary goals are to evaluate a possible viral outbreak in the outpost, and if such an outbreak exists she is to “purge the station”. As she’s prepped for her mission, Agent 1.22 is given several physical upgrades as well as data uploads regarding atmospheric conditions and facility staffing. Through all of her preparations, Agent 1.22 is silent, complacently allowing the mechanical arms of Mnemosyne to do their work. When she’s put in a dropship and sent off to accomplish her mission, the action is pretty straightforward. Covering all of the sci fi action bases, we’re treated to: A) a crash landing, during which we’re given another flashback panel of what looks like an oncoming semi truck, B) the introduction of a possible antagonist behind the outpost’s lockdown, identified as “Director Miller”, who seems determined to stop Agent 1.22, C) an encounter with a couple obviously infected people who attack Agent 1.22 on sight and are handily dispatched, and D) a couple quick fights with some security robots, sent by the mysterious Director Miller. If you’re not interested in potential spoilers, stop reading here and check this book out. When you’re done, come on back and read the rest of my review, because I’m not done here… I feel the need to explain the impressions I got from Agent 1.22, and I can’t really do that without talking about how the issue ends. We’re never given any reason for Director Miller’s determination to stop Agent 1.22, whether or not she’s behind the complex’s lockdown or the virus outbreak, and to be honest I really didn’t feel the need to know. If we’re taking Agent 1.22 as the POV character in this book, it makes perfect sense that her experience would be limited to her programming… Enter the base, upload relevant information on the virus outbreak, destroy the base if an outbreak is confirmed, and return to the Mnemosyne for data uploads and a return to cryo-stasis. All of that isn’t what the story is about. The story, in my opinion, is in the flashbacks first and foremost. The flashbacks progress, and in the end we see that there was a tragic accident in which a semi hits a car head on. We’re shown a young girl, seriously injured, clutching a teddy bear. The assumption is that these glimpses belong to Agent 1.22 herself, and this seems to hold up as sees her reflection for the first time, in conjunction with a flashback of the girl in a hospital bed (still holding the teddy bear), and gives her only spoken words in the book. The secondary story is in the computer presence of the Mnemosyne and its acknowledgment of its role as surrogate parent and caregiver for Agent 1.22. The issue closes as an order is given to wipe the Agent’s memory clean, and to freeze it… “It”, not “her”. This harsh directive seems to come from outside of the Mnemosyne. I don’t know why, but I got the impression that Mnemosyne’s compliance with the order was reluctant… no specific reason, just an impression I got. 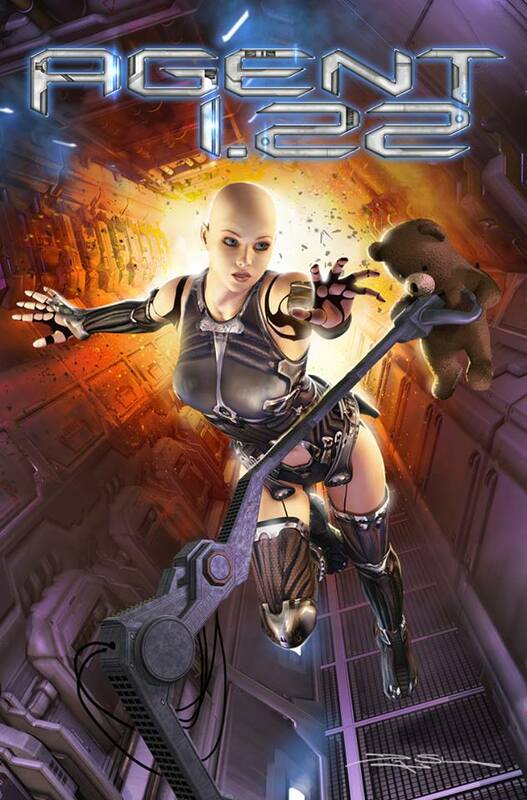 The closing panels of the book show Agent 1.22 sound asleep, back in her cryo-tube and placed in storage until her next mission, but not before we see a single robotic arm placing a teddy bear in her arms. As parents, we don’t like to see our children hurt or put at risk. We do want them to realize their potential and develop their sense of self, to grow into the people they’re supposed to be. When they are hurt, we do whatever we can to comfort them. Being a parent is tough… Just ask Mnemosyne.